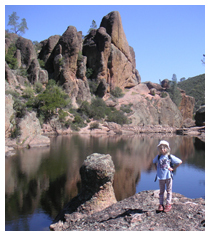 Family Time at Bear Gulch Cave – Pinnacles National Monument – Tour Guide Mark – Let's Go Exploring! ‘Family Time at Bear Gulch Cave’ was published in the June 2008 issue of ‘Bay Area Parent Silicon Valley’. My seven-year-old daughter Anna was first out of the car upon arriving at Pinnacles National Monument, “Come on slowpokes, let’s go!” We walked up a meandering canyon trail to the entrance of the Bear Gulch Cave. Pinnacles National Monument is a two hours drive south of San Jose. This natural playground includes bizarre rock formations, house-sized boulders, and my daughter’s favorite, Bear Gulch Cave. We felt a cool breeze from the cave’s mouth. Anna instructed us, “Mama, Papa, don’t forget your flashlights.” My wife, Christiane and I smiled and followed our young adventurer. At first, the cave was dark then our eyes adjusted to the low light. We appeared silhouetted against shafts of light that pierced the ceiling. Small rocks crunched nosily under our feet as we walked. A bat darted overhead. Being mindful of the bat’s home we walked more quietly and lowered the beams from our flashlights. 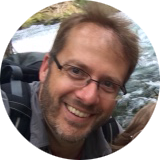 In the distance, we heard a low rushing noise from a waterfall. Several minutes later we stood next to a gushing spray of water. Our lights illuminated the waterfall that disappeared twenty feet below. Further in the cave the trail dove underneath enormous boulders that were interlocked between the walls of the canyon. “These are as big as the house!” exclaimed Anna. 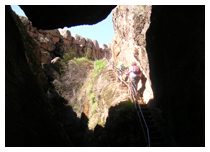 The trail snaked between boulders to reveal a narrow staircase carved into the canyon wall. We climbed the stairs and out of the cave. We were greeted by a small reservoir surrounded by amazing and awkward shaped rocks. My daughter spotted our favorite picnic area across the water. We enjoyed lunch in a shaded area. Overhead a vulture, or a condor, glided on thermals. In the distance rock climbers carefully made their ascent up a stone monolith. A hummingbird zipped in close, startling us, then quickly sped off. The rest of the afternoon we continued to explore the many trails of this natural playground. Finally, the sun became low on the horizon and signaled the end of our day. We returned to the cave and back to the parking area. As the family car turned onto the highway I asked, “So Anna, what was best about today?” No reply. Our young adventurer was asleep. ← One Ladybug, A Thousand Ladybugs…One Million Ladybugs!